Meet McKenna Balzer, one of our new digital interns! I recently joined Lerner’s Digital team as a Digital Intern. In June, I graduated from Hamline University with a degree in English, Education and a concentration in Creative Writing. and helping with audiobook creation, as well. This has all been very new and very exciting to me. I look forward to learning even more! 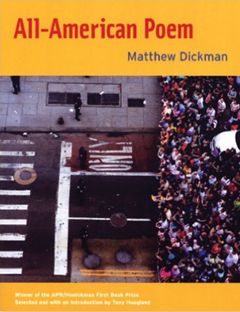 Right now I am reading All-American Poem by Matthew Dickman, which is quickly becoming one of my favorite books. I’ve always loved poetry and after reading Dickman’s poem “Love” in a literature class my sophomore year of college, I was immediately drawn to the honesty and realness in his writing. My best source for finding new book recommendations is conversations with my friends and family. I also love to walk the aisles of books at thrift stores to see what I can find. One of the great things about shopping for used books is occasionally finding a beautiful inscription on the inside cover and knowing that the book you found may have been very special to someone at one time. 5. Top 5 (or so) favorite books. Go! Two of my favorite poetry books are All-American Poem by Matthew Dickman and Piano Rats by Franki Elliot. I love to read poetry that goes beyond the romantic and discusses the reality of life and what it means to live in a sometimes very messy world. In Cold Blood by Truman Capote was one book that I enjoyed after reading for a literature class in college; it was very fun to analyze! One of my favorite children’s books is The Giving Tree by Shel Silverstein. It seems the older I get, the more heartbreaking it becomes, never failing to make me so very grateful for what I have and what I have been given. Growing up, I also loved reading the children’s book Mama, Do You Love Me? by Barbara Lavallee with my mom. I admire many writers and people who are passionate about their art, but no one compares to how much I admire my mom. It has meant so very much to me that she has always been there for me, encouraging me to constantly pursue my dreams. I am so thankful for all of the times she has happily listened as I ask for her opinion on my writing, or on anything, really. I truly believe one of the most wonderful things we can be given is love and support, and she has shown me that every day. I only hope to become half as kind hearted and beautiful as she is. If I could live anywhere in the world I would live in Ireland. Coming from an extremely Irish family who celebrates St. Patrick’s Day with a feast, I always had a great desire to go. After travelling there with a creative writing class this past May, I did not want to come home. Ireland was greener and more beautiful than anything I had seen in my life. The people were so friendly, and the history and beauty on every single street corner made it unlike any other place I’ve been. I look forward to going back someday very soon, 17 days was most definitely not enough time!